For best results, concentrate on foliage and flowering plants that are renowned for being easy to care for and hard to kill. Save delicates and exotics for the experts. 1. Find a good position for the plant. Plants like an even temperature and bright, indirect sunlight. 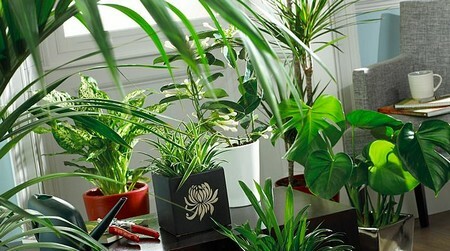 Keep plants away from cold draughts, central heating vents, and from behind drawn curtains. 2. Get the amount of water right. Plants like some water, but not too much. Water plants in a sink (ideally using boiled, cooled water). Let the excess drain away, before replacing a plant on its saucer. Standing in a saucer-reservoir all day kills more plants than over-dry soil. Place a water-indicator strip in the soil to tell you when to water. Plants flourish when fed nutrients designed to promote stem and leaf growth, heed according to the care instructions with standard plant food, or choose long-life food spikes that release nutrients into the soil for tip to 60 days. 4. Keep the leaves clean. Plants should be dusted with kitchen roll dipped in tepid water. Others, such as African Violet, have leaves that must be dry-dusted. Blocked leaf pores cannot take in carbon dioxide efficiently. 5. Deal with insects promptly. Keep plant leaves and buds free from pests. Wash off small numbers of aphids and spider mites. If you are not organically minded, reach for spray guns of houseplant insecticide for serious attacks. Repot when you can see roots coming through the bottom of the pot. Choose a slightly larger pot; one that is much larger may cause leaf-drop through shock. Put bark chippings into the base of the new pot to help drainage. Cover with 2.5cm (1in) of new compost. Tip the plant carefully out of its old pot and place it in the new compost. Fill the spaces around the sides of the plant with new compost. Pat the compost down with your fingers, and water sparingly.